What a great weekend, with a good turn out of riders and bikes, perfectly prepared track and wonderful weather. I would like to thank all the members and their wives and families that helped out over the weekend as usual, Barbara Brady for her food preparation and keeping everything moving smoothly. Racing got underway around 10.00am with 3 rounds of capacity racing before lunch and 3 rounds of grade racing after lunch with the Dandaloo Handicap race at the end of the day. 125/250 4stoke – Paul Gibbs / Nick Ferguson / Brad Green put on a great display of tight racing all morning with Paul came out on top. 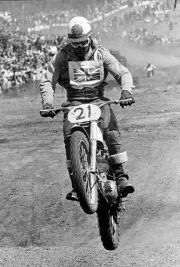 250 – Brian Watson saw off challengers from Mike Godbold and Dave Taylor to take out the win. Open – Justin Clayden showed his fast and smooth riding style to win comfortably from Dave Latham and Mike Lawrie. Sidecars – Sarah and Rodert Dillon took out the sidecar day with newbies Mike Smith and Brad green putting in a good showing and Gary Johnson and Nick (can i get any thinner) Ferguson rounding out the top 3. Over 55s – Kevin Clayyden showed where his some got his riding skills from. Nick Fitzgerald and Mark Steele kept him honest. Over 65s – Frank Barron showed that age doesn’t matter by taking out the over 65s with Denis Mohoney and Alan Mitchell taking out the minor placings. Pre 70 – Mike Lawrie really had a good day taking out the Pre70 class with Mike Godbold and Andrew Irving having great rides as well. A Grade – Once again Justin Clayden took out the win from Dave Taylor and David Latham . B Grade – Kevin Clayden / Paul Gibbs / Brad Green put on a great display with Kevin coming out on top. C Grade – Frank Barron was still pushing his CZ hard to take out C Grade from Sarah Dillon and Ron Chandler. There were a few riders with lumps and bumps from the day but where can you have so much fun, to see all the smiling faces makes all the hard work worthwhile.